We may never visit this garden in Russia, but the tall plynth elevates the urn above the foliage and blossoms giving the evey a focal point. Antiques and vintage garden pots, statuary and found objects can be part of the answer. These accents, vintage and otherwise, can easily be found by searching your parent’s basement, looking in shops of all sorts, and browsing for tree lawn finds (garbage day). Any of these places may hold the perfect treasure to perk up your yard. The past holds a bounty of delights in colorful glazed pots, from vibrant orange and yellow to calm seafoam and jade green. Besides great glazes, these pots come in interesting designs - embossed circles, angels and flowers. Identifying pots can be easy, as many companies marked the bottom of a piece with a number that indicated its shape and/or size. In addition, factories such as McCoy, Sewanee and Redwing embossed their names on the bottom of a piece. These fabulous pots made in America from the 1950s to the 1970s can spice up any space, indoors or out. Vintage pots may be found for as low as $10 for small common pots to about $95 for larger ones. Creating interest can be done with a single large pot. However, blending various shapes and sizes of the same color can create a distinctive focal point. No matter your vision, mixing less and more expensive pots will give you high impact. So, find a series of steps, a corner of your patio or bare spots in your garden that could use height, color or interest and see if a vintage pot makes it sing. There are other ways to achieve points of interest. Cast stone and concrete garden accessories from the early to mid-20th century can give your garden classical drama. Cast pieces come in many forms - small toads, playful figures like Putti (chubby babies), classical urns, and birdbaths. The hard surface serves as a backdrop for the foliage and blossoms in your garden. Urns give a patio presence. Statues and birdbaths add height within your garden. Made in various factories, the older pieces have a historic patina that gives your garden a sense of history and age. This aged look is not as expensive as you may think. Small figures like toads may cost $40, while an average rustic planters may run $65. Cast bouquets of fruit flowers may cost $125 and larger pieces such as urns and fountains can cost anywhere from $225 to $500, respectively. Although this may sound rich, older carved stone pieces can be five times these prices. And there’s more! Found objects, yes, random objects can be that perfect accent. Someone’s junk can be your garden's treasure. For example, consider a vintage iron chair as a garden pot holder, an industrial mesh gate used as a trellis, and salvaged iron industrial castoffs placed in between plants not only creates height but also have a patina that changes colors with the rain and life outside. However, less traditional salvage could bring humor to your garden. A broken down stove with planted pots overflowing with plants and nestled among foliage. Even large glass chunks placed in a stream like pattern can be the non-flower flower bed. One thing about salvage the price can be right, zero dollars in many cases, so dream the impossible and have courage to do it! 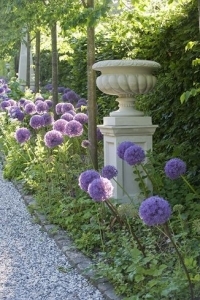 Designing a garden is like designing a room and simple rules applies - balance, proportion, color and texture. Look into your yard and see what is lacking. When doing this look from the street, look from a second floor window, look from the garden itself. Multiple perspective will let you view your yard with a better eye. Now that you have a map of your garden and you see can figure out your style: vintage pots, classical cast stone or found objects. Have fun and celebrate your creativity with a glorious garden!